This section of the site outlines some of the observations and discoveries made in this research project. They are listed here. Ancient sites in West Penwith are clustered in two quite distinct areas, north and south. The north has quoits and the south has double menhirs. There are two areas mysteriously empty of ancient sites, in the northeast and southwest of the peninsula. The area of Penzance and east toward Hayle is also noticeably empty of sites. This is one of the big discoveries of this research project - an integrated system of ancient site alignments covering West Penwith, established in the neolithic period and providing the basis for the location of later sites built in the bronze age, especially stone circles. In the southern half of the peninsula is a series of double menhirs not found in the north. There are some in Wales though. 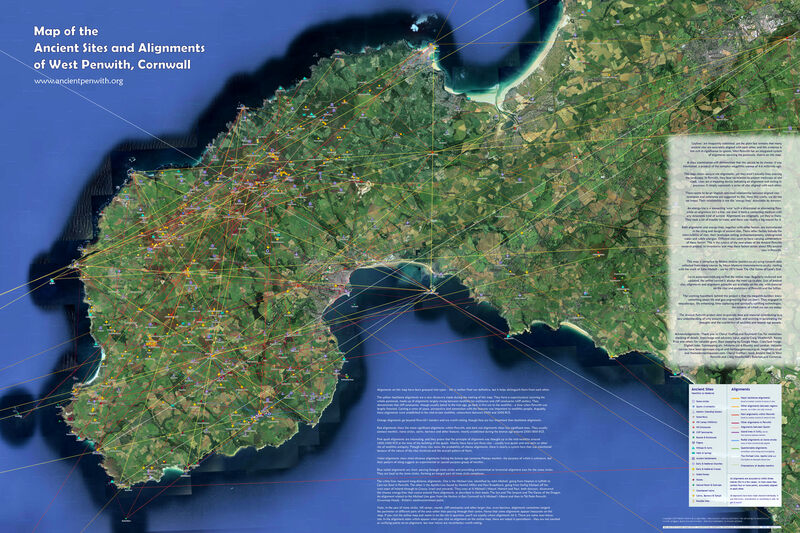 There are some fascinating parallel alignments in Penwith and in the Scillies and also between them, as well as a system of four parallel alignments between Penwith and the Lizard peninsula. Some alignment nodes such as Boscawen-ûn, St Michael's Mount and the Botrea Barrows have somewhat symmetrical arrays of alignments passing through them, sugsting geometrical patterns in the Penwith alignment system - though there is more research to be done on this. The earliest alignments in West Penwith, linking the neolithic quoits, all form an interesting pattern. Hills form a key element in forming the Penwith alignments system, and as sighting points from many ancient sites. Studying the alignments passing through an ancient site not only suggest why it was placed there, but also can give hints about its dating. Insights into the para-technologies created by the people of the neolithic and the bronze age, and teir purpose.